Paul Krugman on the Strange Death of Expansionary Fiscal Policy – Grasping Reality with Both Hands. A plurality of voters want to see a new economic stimulus bill–called a stimulus–to create jobs. Even 18% of Republicans and 32% of independents think a new job-creating stimulus bill should be Congress’s highest priority. Yet is Congress going to pass one? No. Is the Treasury leveraging up its TARP money and using it to stimulate the economy? No. The Federal Reserve–well, the forecasts are that the Federal Reserve’s quantitative easing programs may add between 0.2% and 0.5% to economic growth next year, although I do not see how the estimates can be so high unless the program has a large effect on inflation expectations. This is an absolutely remarkable government that we have. And an absolutely remarkable political class. The Strange Death of Fiscal Policy – NYTimes.com: One clear result of the midterms is that we won’t have anything like a further round of stimulus. And this, in turn, means that the narrative all the Very Serious People will tell is that fiscal policy was tried, it failed, and that’s that. But the real facts don’t at all support the conventional wisdom. Actually, let me focus on an international comparison. 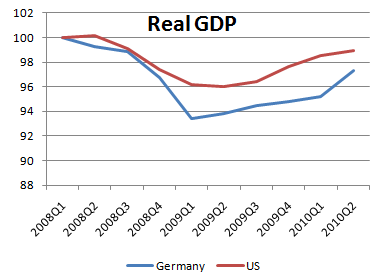 You often hear the US experience contrasted with Germany: America, we’re told, went for Keynesian policies, while Germany chose austerity, and Germany did better. Follow the links for the rest.